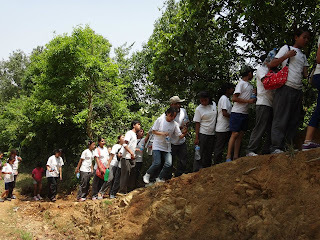 When I first heard the news, that we were going to Lakure Bhanjyang for a day trek, I was both nervous and excited. Nervous, because my movements are not very coordinated so I tend to fall a lot during such trips. Excited because it was my first trip with my Koseli family. However as the days passed, I forgot all about my apprehensions and instead got mentally all geared about my upcoming trip. The name Lakure Bhanjyang itself started sending a wave of tingling euphoria inside me. As the day came, I was all set to ride the storm. We took the bus till Dhongre. 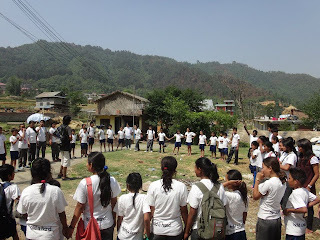 All the children were anxious to start walk and experience the beauty of nature.We were divided into four groups, each group had a teacher to supervise and a senior student who acted as the group leader. Monsoon was beginning to set in. We were experiencing rains off and on. But on 19th May, the sun welcomed us shining bright early in the morning. To my surprise, the trail was inclined from the first step of the trek. Don't under estimate the hills of Nepal, after all we are country of Mt. Everest. A simple walk for Nepalese is not really a simple walk for other people including a lot of people who grow up in Kathmandu valley. As expected, the walk was tough and after crossing one hill we took a break and played some team building fun games. After crossing two more hills, my stomach started growling for food. My kids also needed a break. The weather too, by now had changed its mood. The skies had turned from blue to grey and we experienced not only rain but hail storm while we had lunch. The time had come to walk down. 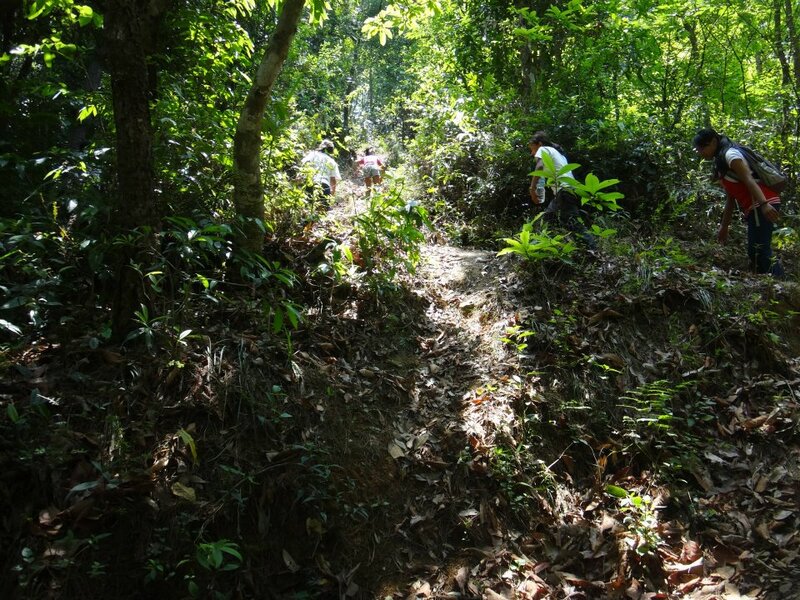 We knew descending the hills was going to be very tough with the trail now being wet and slippery. Renu Ma'am and I made a record in slipping while walking down the hills. Had it not been for my colleague Krishna, we would have actually rolled down. The kids used to walking in the hills and mountains before they were forced to migrate to the slums of Kathmndu valley, were very comfortable and managed the trail with phenomenal ease. Before we realised, we had reached the bus stop and the adventure had come to an end. The rain had washed our sweaty palms and faces, happily we walked to the bus. It was such an enriching experience that I cannot describe my feelings in words. I only started to realize the exhaustion around and within me, once I was back in the bus. Thank you Hriday group and Padyatriz for arranging this truly magnificent trip. In conclusion, all I can say that Lakure Bhanjyang is definitely a place worth going and it becomes even more beautiful if you have lovely company, which for me is my Koseli Family. It is difficult for me to describe the mixed emotions of happiness, excitement, naughtiness and freedom which I saw on the faces of my kids. The happy and gay environment of that rainy trek still makes my heart warm.